Discover the Lake and Volcano district in Chile. Mountain Biking Chile’s southern backroads is the ultimate green tour. This well supported 15 day mountain bike tour has been especially made for intermediate and advanced mountain bikers. Accommodation at Lodge Laguna Blanca. The ride offers great scenery with views overlooking volcanoes Lonquimay and Llaima. We’ll ride from the little village of Malalcahuello toward the Nalcas-Malalcahuello National Park, where the main attraction is the Lonquimay volcano and ancient forests of araucaria trees (monkey puzzle tree). This land is the territory of the indigenous people Pewenche and we’ll ride its famous trail (BL). We’ll drive 30 minutes in the van to the village of Sierra Nevada. 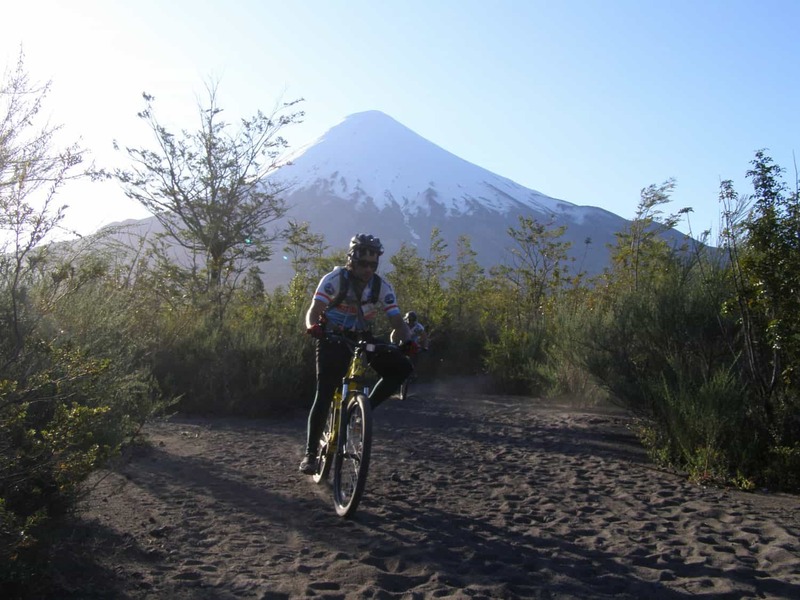 Then we will take the mountain-bikes to cross the roads of the Araucanía Andina. We’ll ride the bikes by La Fusta, a beautiful road that goes along of ancient forests of Araucarias. The scenery couldn’t be better when we bike alongside the lakes Galletue and Icalma. Here in Icalma, we begin the single track that will take us to the top of the hill Batea Mawida; if we are strong enough we can reach the summit and then enjoy the descent back to Icalma. At this point we will be gathered and transported to the village of Melipeuco (90 minutes drive). (B, BL). Accommodation at Eco-Lodge La Baita Conguillío. Bike traveled distance = 25 km Time cycling: 3 hours approx. Today in morning you will have to be ready at 6:45am and if the weather conditions are favorable, we’ll start driving to the Pucón Ski Resort located at the base of the volcano at 1.400 meters / 4.593 feet. Ascending the active Villarrica Volcano is without a doubt a once in a lifetime experience, the climb is not technical, but you need to be in good shape to reach the summit. Once we arrive at the parking lot we can buy the lift ticket that will take us to the higher part of the ski courses at 1.800 mts / 5.906 feet, saving us almost 2 hours of climbing. From the top of the lift we begin ascending the slopes of the volcano, stopping briefly every 30 minutes, having a longer break to eat our food when we are half way to the crater. If we find hard snow or ice we’ll put on the crampons and use the piolets and after 5 hours we’ll reach the live crater at 2847 meters / 9.349 feet above sea level. The views from the top are absolutely mind-blowing, overlooking five lakes and several volcanoes in the distance such as Llaima and Lanín. The descent is quite fun, especially when we can slide down the snow on our rear ends. In the winter season and only if you are an experienced skier or snowboarder, we can climb the volcano carrying the equipment and make a thrilling descent that takes only 30 minutes. We’ll return to the vehicles around 5 pm and immediately head off to Pucón, where we hand back the gear. We start this amazing mountain bike trail from the recreational area of the reserve followed by riding across the native forest until we get to the upper part of this natural area and enter the National Reserve Mocho-Choshuenco. We keep pedaling until the road ends at 1,800 m altitude (5,905 ft) and from this point we begin the single track towards Mocho Volcano (2,422 meters). After 4 hours we have reached the plateau next to Mocho and take-in a magnificent view of the Choshuenco Volcano. We’ll eat a picnic and then head down to the valley that links both volcanoes. The landscape from the part is absolutely breathtaking, overlooking massive volcanoes such as Lanín (3,710 m) and Villarrica (2,847 m). The Alerce Andino National Park is a mountainous zone that covers 39.225 hectares (96.927 acres) situated east of Puerto Montt City, between the Gulf and the Estuary of Reloncaví and south of Chapo Lake. It boasts of over 20.000 hectares of Larch trees forest (Fitzroya cupressoides) and around 50 small lakes scattered throughout this uneven geography. It is an ideal place for trekking, mountain climbing, hiking and nature watching. Traveling from Puerto Varas, the park is 60 km away, taking around 1½ hours by van. The road is considered the starting point of the world famous Austral Road (Carretera Austral), passing by beautiful evergreen forests, farm fields and amazing mountain peaks. We start walking on the main road of the park, until we get to the entry of a challenging trail that will take us through a larch tree forest called El Rodazal. We’ll have to put a lot of effort because this trail is like a natural stairway that ascends endlessly for 3 hours of hiking. ◦ Rate per person, USD $4,940 based in double occupancy (6 guests minimum). ◦ Group rates based on 10 people, USD $4,725 per person based in double occupancy. ◦ We can confirm this tour with a minimum of 6 clients. ◦ Private Van with bike trailer. ◦ 14 Nights’ accommodation at hostels, cabins and mountain lodges. ◦ Entrance fee to Hot Springs and all activities according to the itinerary. ◦ Air Fare (international and domestic flights). ◦ Cycle parts (some parts available for sale). ◦ Meals, beverages & cocktails not included on itinerary. ◦ Entrance fee to National Parks. ◦ Gratuities at hotel and restaurants. ◦ Bike rental (available upon request): USD$350. Mountain biking and hot springs. Intermediate: You’re active on your days off, and recreational biking may even be your weekend sport of choice. You love to ride, and it shows in your endurance and strength. Our intermediate bike tours offer a steady but active pace (between 3 to 5 hours), with opportunities to push yourself. Expect some challenging climbs, with great descents over rolling terrain. Average distance per day: 20-30 miles / 30-50 km. Private departures from November 2018 until April 2019, and November 2019 to April 2020. Carriers for travel insurance include World Nomads, Travel Guard and Travelex. You may also consider insurance that covers emergency medical evacuation. Search the web to find the best deal that suits your needs – read the fine print -. In this part of Chile there are no insects or animals that represent a threat to human beings. We highly recommend getting the Chile Airpass ticket with Lan Airlines, which includes the international flight from Madrid to Santiago (Chile) and the domestic flights Santiago(SCL)- Temuco(ZCO) / Temuco-Santiago(SCL). This Airpass is definitely less expensive than buying the flights separately and what’s more important it is very flexible if there are some unexpected last minute changes. Lan Airlines Airpass can be purchased at any IATA travel agent. Note: The local flights in Chile have a luggage allowance of 20kg. You will need to pay excess if your baggage exceeds this. There is an allowance for cycling equipment charged at 3kg (approx $5 per kg). Visa to enter Chile: No advance Visa application is needed for entry into Chile. Australian and New Zealand citizens entering Chile for tourism purposes will be charged a $160.00 processing fee payable on arrival. Cash and credit card accepted. US and Canada citizens no longer need to pay the reciprocity fee ($160.00) to enter Chile. A valid Canada or USA passport is required travelling as a tourist for 90 days. Most riders choose to bring their own helmets, but if you prefer, we have a small number of helmets available on a ‘first come, first served’ basis. Please let us know in advance if you’d like to use one. All our bikes are equipped with Wellgo pedals and toeclips. We will be happy to substitute any pedals you choose to bring. Amity Tours also has a small number of Shimano pedals, available on a ‘first come, first served’ basis. Please let us know in advance if you prefer to use them. There is nothing to be worrying about altitude sickness. We will never get higher than 4,200 feet. In Chile, the gratuity for hospitality services is normally 10% of the bill. People usually tip in restaurants, hotels and the local staff of guides. You shouldn’t tip taxi drivers, baggage carriers and bar tenders, they do not expect any tips. At the end of the trip gratuity for the crew for a job well done is highly appreciated. We encourage you to use your discretion and tip according to the caliber of service you receive. As a guideline, the industry standard is $120 dollars per person, per guide.